Basically out of hard boulder problems to send in the U.S. during the summer months, Daniel Woods has turned his attention to taking his sport climbing game to the next level*. Well known for his ascents of many V14s and V15s, previous years have seen Woods climb sport routes as hard as 5.14c like the American classics Livin’ Astro and Necessary Evil. This year he is well on his way to eclipsing that grade over in Europe. 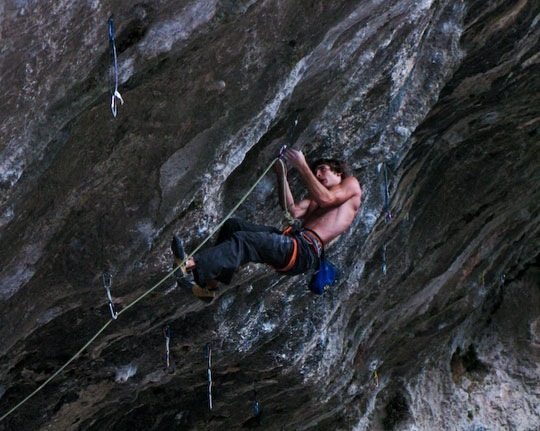 Climbing at the Deverse sector of Gorges du Loup, France, Woods has been working himself back into route climbing shape ‘with the quickness’ as they say. Most recently he sent Quenelle Trophy (5.14b post break) on his 2nd go as well as Total Eclatch (5.14c post break), the latter after decking clipping the anchors on his previous attempt. On his 8a scorecard entry for Total Eclatch Woods mentions that it is “time for the link”. This means he is possibly working on the linkup of Total Eclatch and Honk (a 5.14a he did in 3 tries) that yields the well known route KinematiX (5.14d). First climbed by Andreas Bindhammer, KinematiX gets a lot of grief on a certain Swedish climbing website for being soft, which it may be, but any time you are linking up two routes you’ve already done success is going to come easier than climbing a completely new route. It will be interesting to see how Woods fares in his efforts. All this talk of linkups and starting on one route only to finish on another can be a bit confusing, but luckily there is this excellent topo for the Deverse sector of Gorges du Loup. It should give you a good idea how a lot of these routes relate to one another. *While the part about the hard boulder problems is more or less true, this is my made up reason why Woods is in Europe. Sounds pretty cool though doesn’t it? Decked off Total Eclatch? How did he not get injured…. does anyone have access to a piece of his hair or a fingernail clipping or something? i’m starting to think that we need a DNA test to confirm that daniel is actually human. That’s quite a runout, decking from the anchors. More info Narc? The routes actually not that tall.. I pretty much did the same thing last year, fell from the crux and hit the ground but I was fine. For some reason decking seems to be quite an issue at Deverse, last year one guy fell form 7 PM JP Show and had to be lifted out by a helicopter. People need to learn to belay better I guess?